Grabbing the Rope. Find Out Who You REALLY Are. 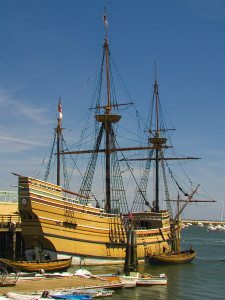 Onboard the Mayflower was a young man named John Howland. He traveled to the new world as the man-servant to Governor John Carver, but something happened on the voyage that showed there were bigger plans for him. During a particularly violent storm, young John was washed overboard. As luck, or providence would have it, he grabbed hold of a rope as he went over and held on, literally, for dear life. Immersed in the waves, he didn’t let go and was dragged back onboard. John survived that first winter and many more, living to be around 80. He went on to serve the new colony in several important roles, married a fellow passenger and had thousands of descendants. Family history is more than names and dates on a piece of paper. It is the story of who you are, where you came from and the people who endured incredible odds for you to be here. The story of John Howland is just one of the many I found when I decided to trace my own family. Visit the library or the county archives. Remember, the internet is full of amazing information. But not all if it is correct. Verify anything you find by checking it against records, old family bibles, etc. Connect with “cousins” online. They may have already done a lot of the work for you. But, once again, remember to verify any information. com is a great resource for this. Never make assumptions. Just because something makes sense, doesn’t make it correct. Verify, verify, verify. Family history is a huge jigsaw puzzle that will always have pieces missing, but the more you research, the clearer the picture will become. And occasionally, when you least expect it, you’ll turn over a piece you’ve overlooked and one of those elusive missing pieces will just fall into place.